I have been participating this year in the level 1 floral design workshop offered through my garden club. Today at our May meeting the club sponsored a flower show and I entered a design in a class reserved just for the first year students—New Sprouts. This is a building year for the club’s flower show, the first held after a long hiatus. As such, no prizes were awarded this year in the floral design category, rather all entrants received written comments from the judges. On my card I was thrilled to see good remarks for scale, proportion and container. There was also a horticulture component for which prizes were awarded. I look forward to learning more about the horticulture side next year. I forgot to take my camera to the meeting today but had plenty else to remember, so I am not surprised. My floral entry was a traditional round table design. I purchased Eucalyptus, Alstroemeria, Chrysanthemum and Roses. The rest of the flowers came from my garden. This entry was posted in garden and tagged Floral Design, flower design, flower show, garden club, traditional round table design on May 28, 2013 by pbmgarden. It is always so much fun to watch anyone compete for the absolute joy of just being involved, the process. This is lovely! I like the idea of using Heuchera leaves at the base, and the peachy rose and yarrow really set it off. I bet this is a good exercise in concentration – not sure I’d have the patience. Well done! Thanks Cathy, it is a goof form of concentration. I did get lost in it for a long while. 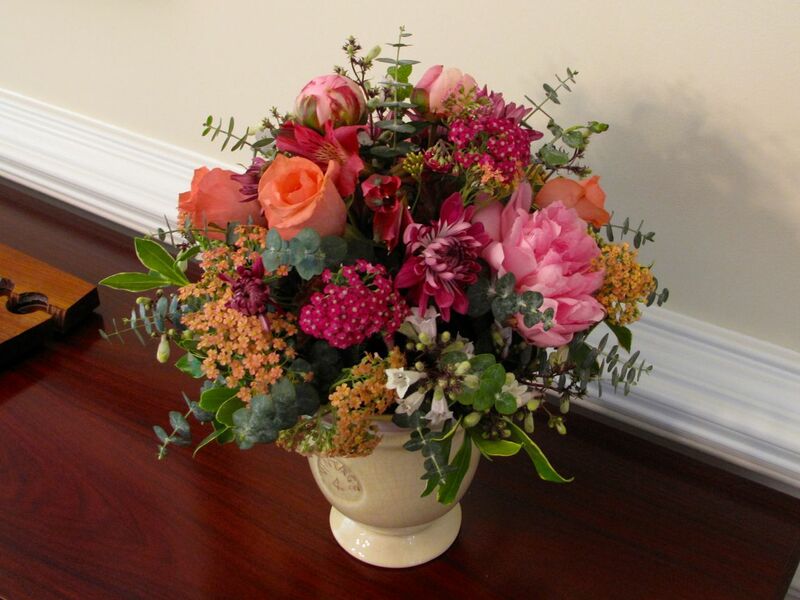 Fantastic, you made a really beautiful arrangement, with a lovely colour combination, well done! Thanks Pauline. It was nice to have some things from yard whose colors worked with the purchased materials. I appreciate your kind words Christina. It was interesting to put it together. This is the first arrangement where I chose the plant materials. For the workshop sessions the teacher supplied them. I like the idea of a category for students. Your arrangement is fabulous. Lovely colors. Thanks Marian. Being know as a New Sprout helped reduce the intimidation and worry and made it more fun. So gorgeous – you are so talented. It’s a shame they didn’t gave prizes this year because I’m sure you would have brought one home! I love the colours you used, absolutely brave mixing pinks with purples, grays and terra-cotta/orange and the result is a sunset impression. Thanks for the vote of confidence Alberto! I like your “sunset” description of the colors. I’ll do my best to be in the next year’s jury. Great! Or you could enter your roses in the horticulture division! Flower arrangements take a special artists eye and you have it…I love the colors of these flowers….I hope to take some flower arranging classes. Oh Donna, thanks so much. I combined flowers from some purchased grocery store bouquets along with items from my garden. It was interesting how the colors choices worked out. I do recommend taking the classes. You probably have a long list of things you want to do now that you’ll have more time. It must have been a wonderful flower show based on the results of your design. The photographs of your arrangement are a teaching success. You have such a good eye for color in your garden floral design is the next successful step. Thanks for sharing this. Thanks. B. is a good teacher. Definitely the show was a good learning experience and I’m looking forward to the next classes.